Be our eyes and ears on election day. 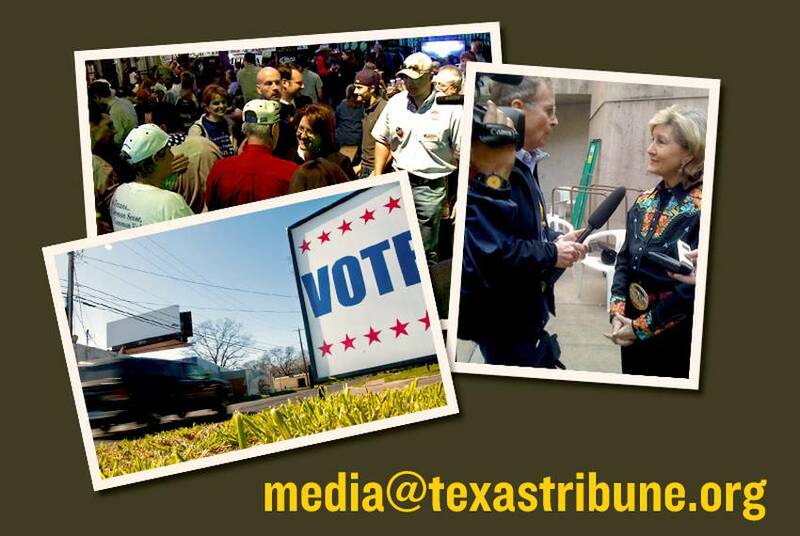 Start sending in your photos, updates and other ephemera from throughout election day to MEDIA@TEXASTRIBUNE.ORG. 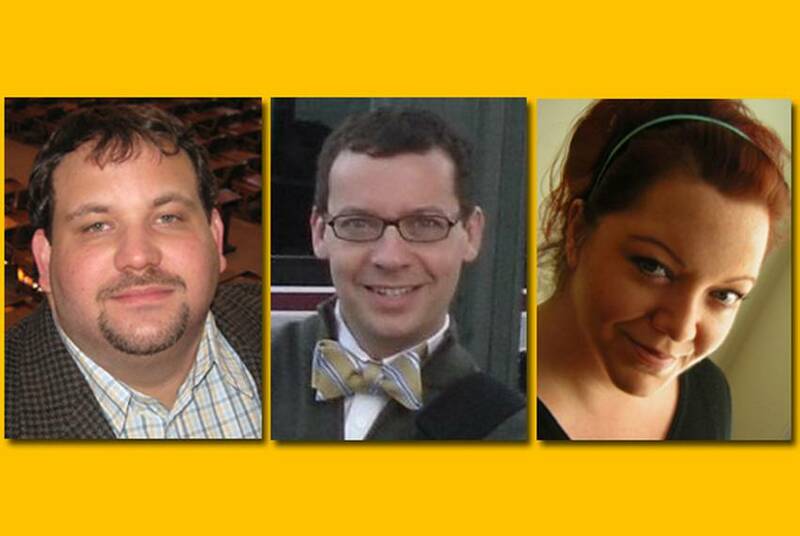 “We’ll do a runoff if we have to," she said Saturday. "I’d like to secure it outright." She paused and smiled. "It will be the upset of the century if that happens." 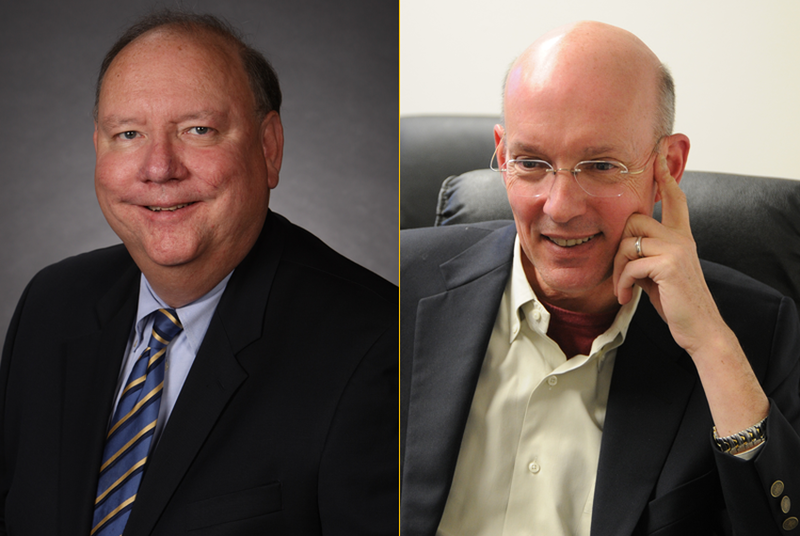 The latest Rasmussen Poll has Democratic gubernatorial candidate Bill White still trailing Republicans Gov. 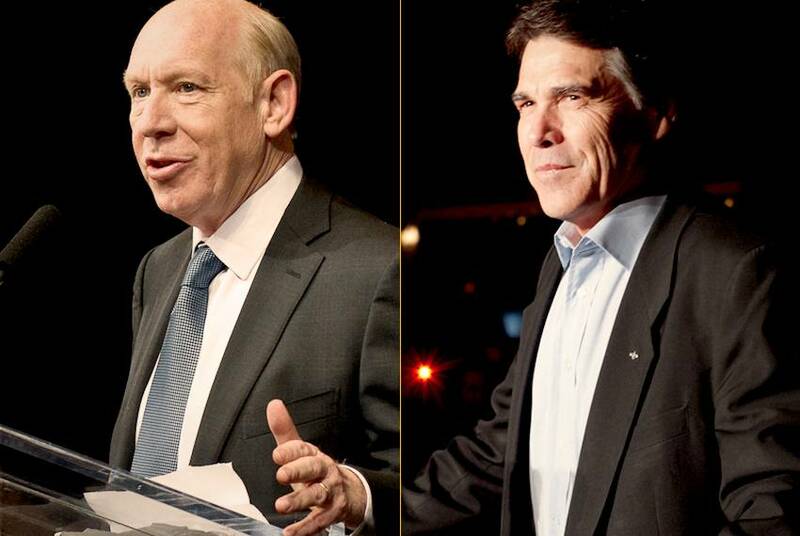 Rick Perry and Sen. Kay Bailey Hutchison in hypothetical general-election contests this fall. 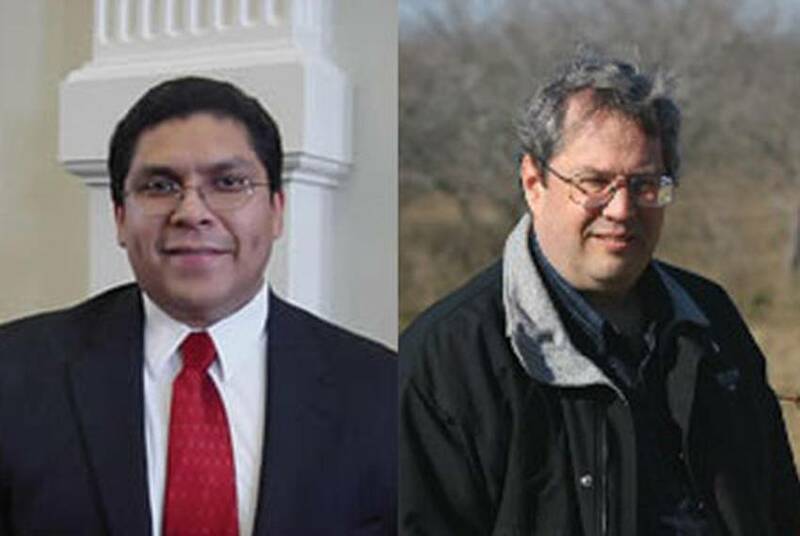 Whether he crosses the 50% threshold or is forced into a run-off when the polls close next Tuesday, the results of the last UT/Texas Tribune Poll suggest that Rick Perry's synchronous orbit over a big chunk of the Republican primary electorate has helped him prove many observers — not to mention KBH boosters and donors — very wrong. 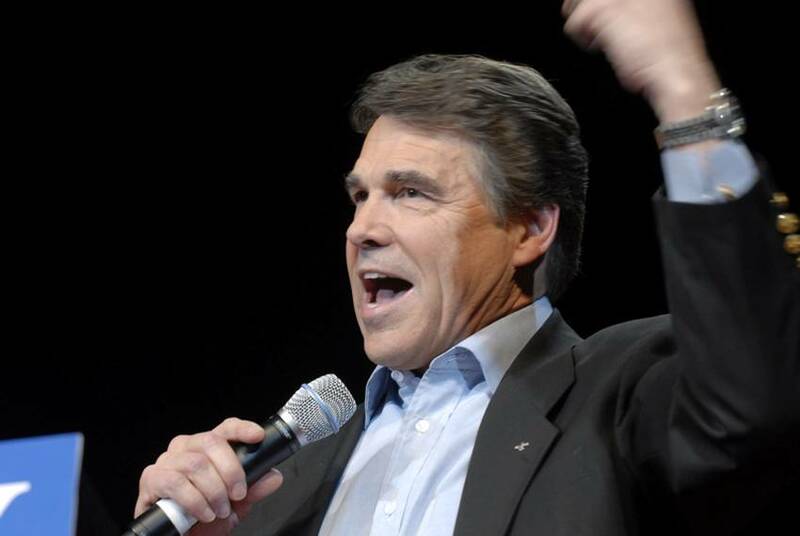 Ads Infinitum: Perry Releases "Tenth Amendment"
Gov. 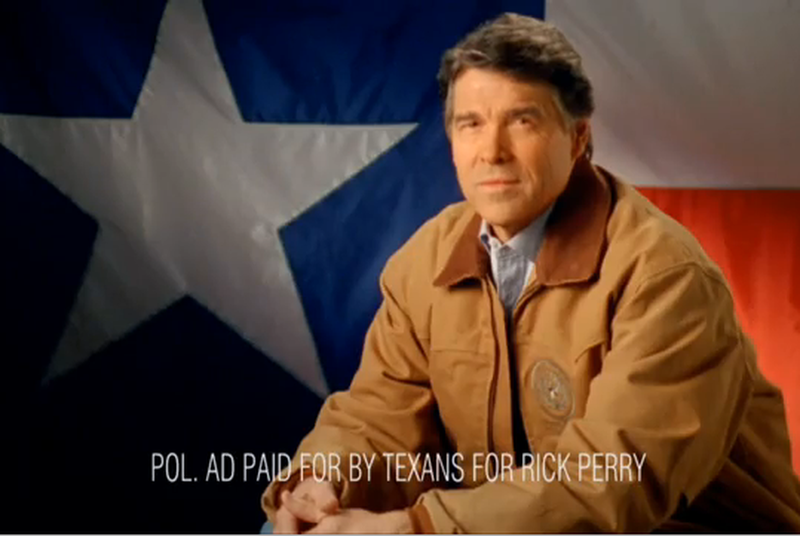 Rick Perry's tapping into an anti-government groundswell with his latest ad. It's called "Tenth Amendment." 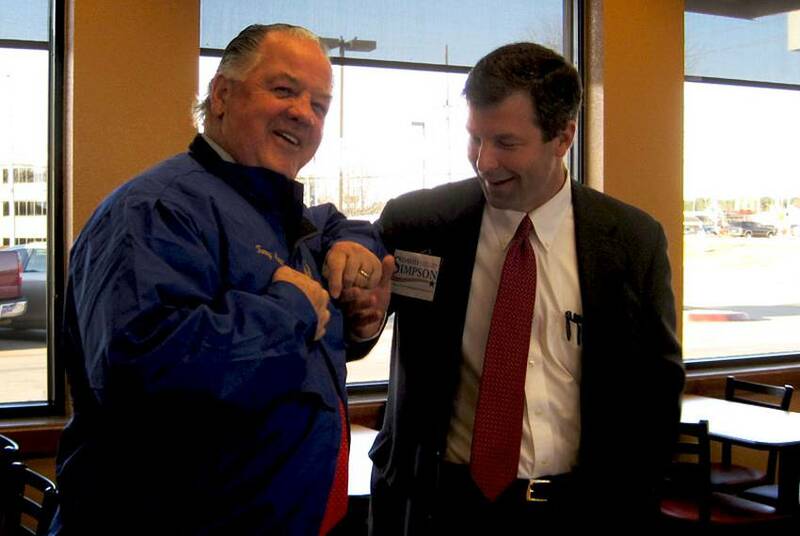 Is this the year that independent-minded state Rep. Tommy Merritt, R-Longview, finally gets his comeuppance from conservatives? 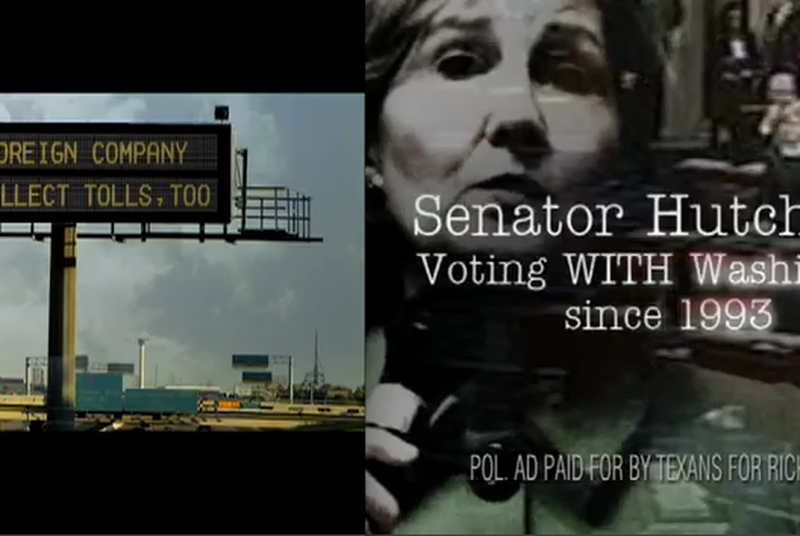 Do attack ads work? In the latest University of Texas/Texas Tribune poll, we tested the effectiveness of two "comparative" commercials run in the governor's race to see if they were persuasive to voters. Apparently so. Five Farouk Shami staffers - including his top aides - have quit the campaign. 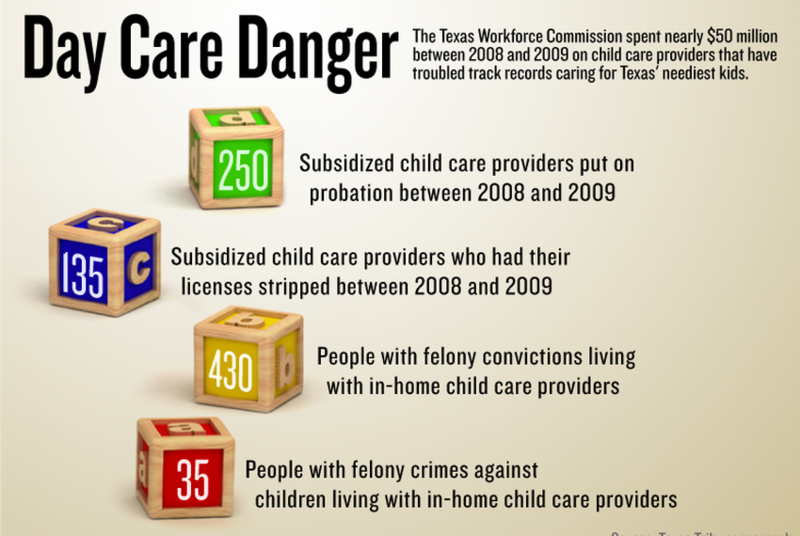 The Texas Workforce Commission spent nearly $50 million during the last two years on day care centers and in-home childcare providers with troubled track records — including sexual and physical abuse, kidnapping, and leaving infants to suffocate and die in their cribs. 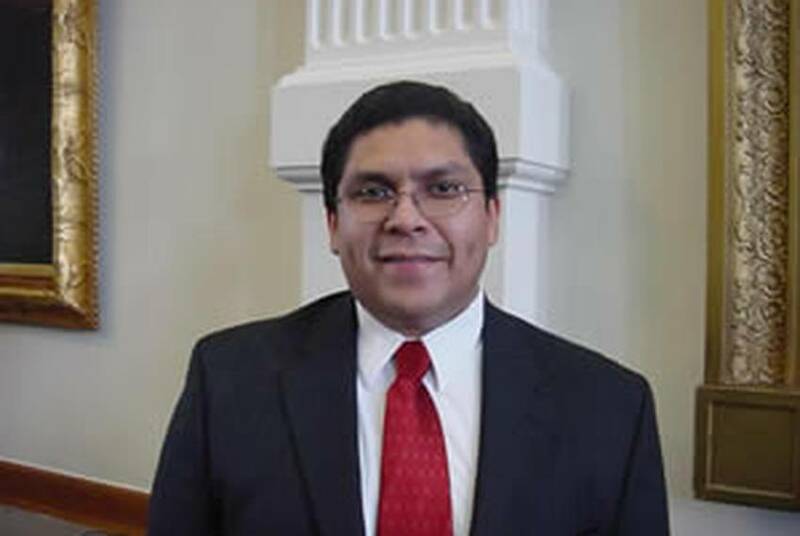 A Texas Tribune review found that at least 135 subsidized facilities had their licenses revoked or denied by the Department of Family and Protective Services in 2008 and 2009 and had their funding immediately suspended. 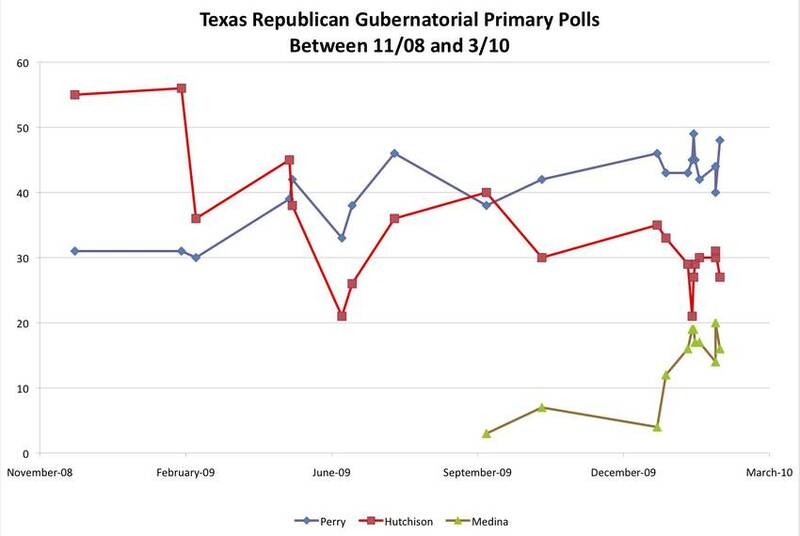 The governor leads the GOP pack with 45 percent, followed by Sen. Kay Bailey Hutchsion at 29 and Debra Medina at 17. 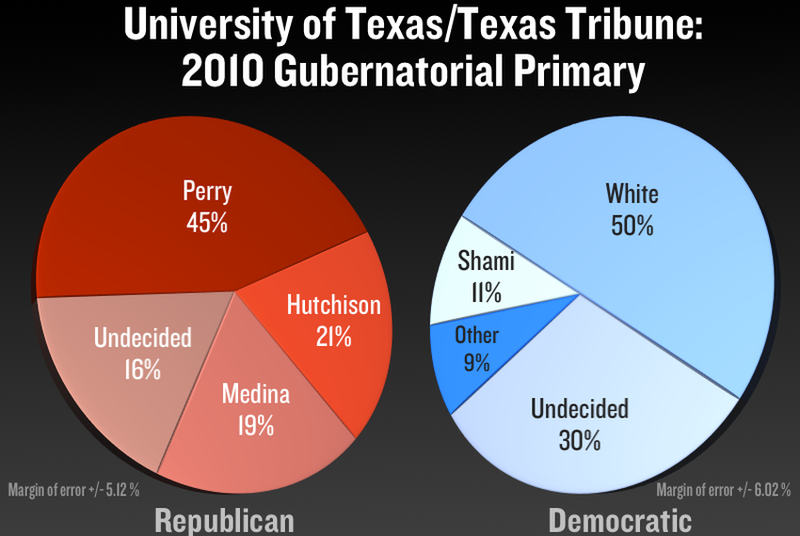 2010: White Only 4% Behind Perry? 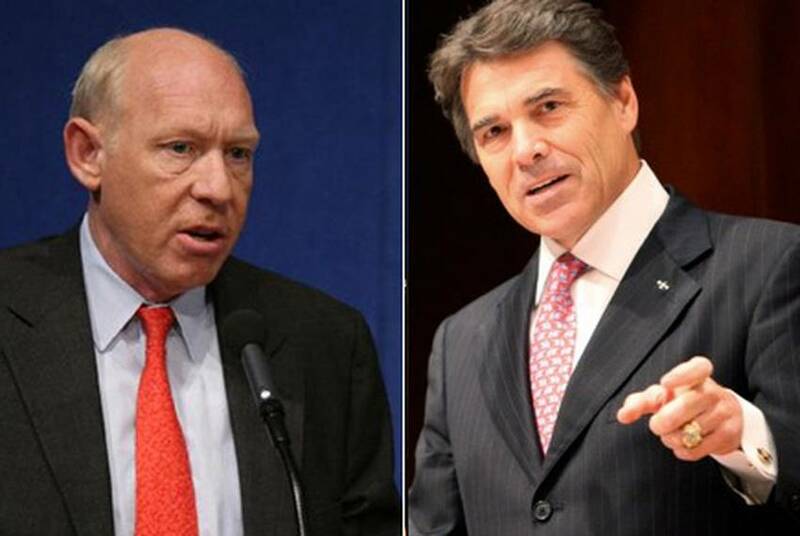 Democrat Bill White runs stronger against Republican Rick Perry than either of Perry's Republican primary rivals, according to a new Daily Kos/Research 2000 Texas Poll. 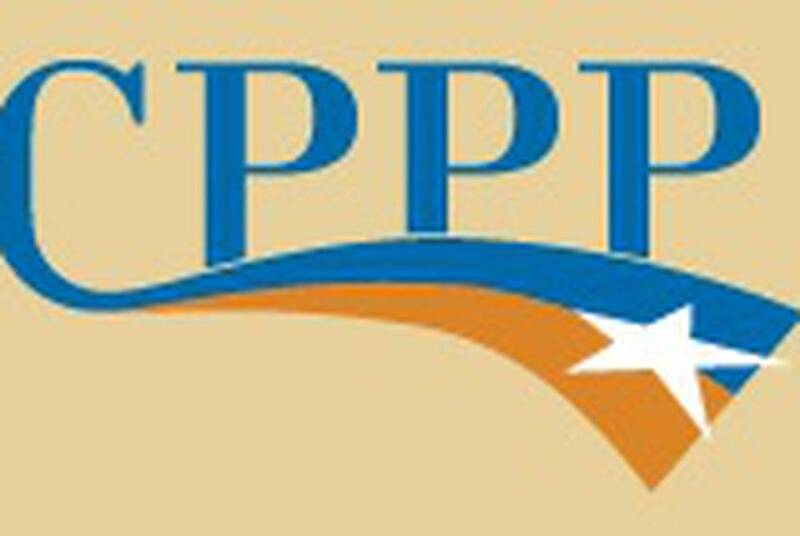 Texas kids are poorer, hungrier and more often uninsured than kids in almost any other state, according to the Center for Public Policy Priorities.